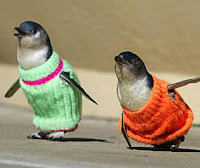 First, penguin sweaters. It's true (snopes.com says so) that the Penguin Jumpers Project (now finished) collected over 15,000 jumpers to help rehabilitate Little penguins (Eudyptula minor - the smallest penguin species in the world) that have been affected by oil spills in Tasmania. As many of you may already know, a good washing with Dawn dish soap will clean the feathers of oil, but often the birds are too sick to be handled and washed right away. In the meantime, these sweaters are put on the birds so that the birds will not preen their feathers, potentially poisoning themselves with the oil. When their strength returns, the birds are washed and the insulating and waterproofing properties of the features restored. Another group was asking for donations of jumpers... for chickens! When chickens are cooped up against each other in hot sheds at battery farms, the can often lose their feathers. Then, if they are fortunate enough to be rescued and moved to free-range conditions, they do not have the feathers to keep their bodies warm in the open fields. According to the rescue group Little Hen Rescue, "Not all farmed hens [we rescue] are bald, but usually there is around 10-20% that are, these hens depending on the time of year stay with us until feathered." While they are growing their feathers back, many of them will be wearing these donated jumpers. 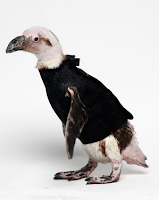 Finally, if I am discussing bird garments, I can't leave out the story of Pierre, a penguin at the California Academy of Sciences in San Francisco, CA. By penguin standards, Pierre is an old bird. In the wild, penguins live about 15 years; in captivity, they live to about 20. Pierre turned 28 last February. When he was 25, he molted, and never grew back his feathers. When it was determined that there was no health-based reason for his balding, senior aquatic biologist & penguin handler, Pam Schaller came up with a creative solution - she collaborated on a penguin-sized wetsuit, which Pierre wore until his feathers and his demeanor recovered. download this Cal Academy document which includes all of the details of why he needed, how they designed, and who made the penguin wetsuit. It's fascinating! In 2009, another wet-suit-wearing Cal Academy penguin made the news. Ralph, a nine year old Humboldt penguin, also had a similar wetsuit experience. Today, a student introduced me to the Vlogbrothers (YouTube Channel). Hank and John Green are brothers who make nerdy videos. Hank lives in Montana, and John lives in Indiana, yet they still engage in nerdy collaboration across the miles.... Apparently, it all started in 2007, when the brothers chose to refuse text communicate and only communicated through voice and vlogs for the year. There are 6 types, or "flavors" of quarks: up, down, charm, strange, top, bottom. Each quark carries a fractional charge, and a color charge. (?!) According to the theory of quantum chromodynamics, quarks are always combined in groups of three quarks (of different colors) or as pairs consisting of a quark and an antiquark (of the same color). (??!!) This is more than my brain can handle, but it is pretty cool. Need a refresher on atomic structure? Visit the Chem4Kids page or watch a Khan Academy video about atoms. Hank Green is also known for his blog, EcoGeek, which he began in graduate school as a class assignment!